A modern trendy Mother of the Bride or Groom wants to look her best, by choosing an elegant rather than mumsie look. Up to date feminine skirts, jackets, dresses and 2 piece suits in luxurious fabrics can be classy as well as figure-flattering. The discerning shopper will know the fashion brands that offer show-stopping outfits. 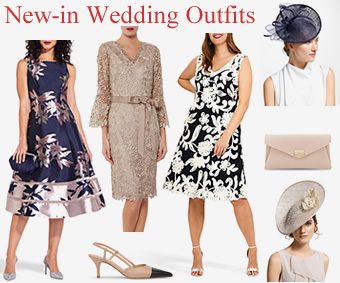 You can also browse more classic Mother of the Bride outfits available in plus sizes plus our wedding outfit inspiration gallery . 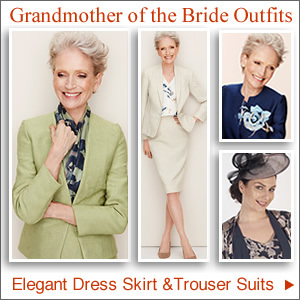 We hope you like our selection of not frumpy modern Mother of the Bride outfits. 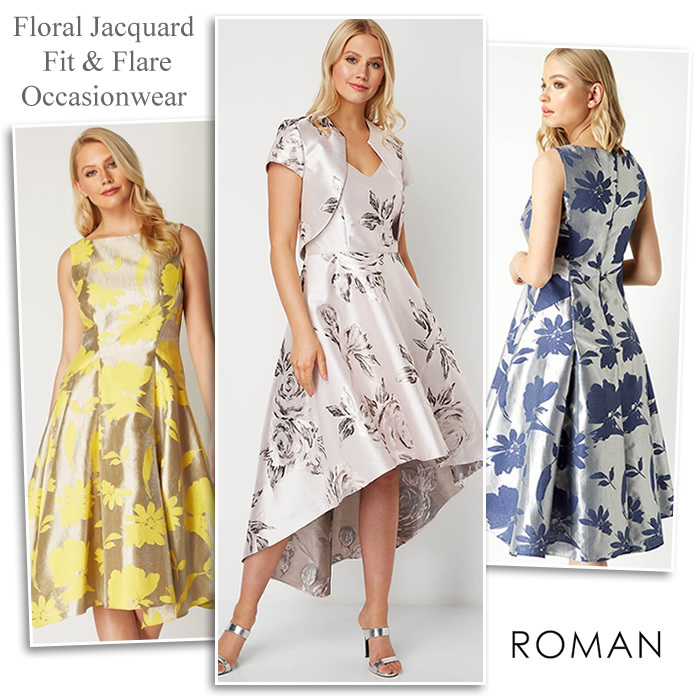 Roman modern Mother of the Bride or groom and wedding guest outfits spring summer styles occasion dresses fit and flare and dipped hem designs with matching bolero. Pale rose pink, metallic gold yellow navy and silver occasionwear. 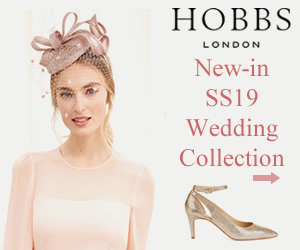 Hobbs occasionwear 2019 New season collection for spring and summer wedding. Pale blue and silver shift dress with matching coat, cream lace and embellished dresses, ivory occasion jacket coordinating shoes and bags. 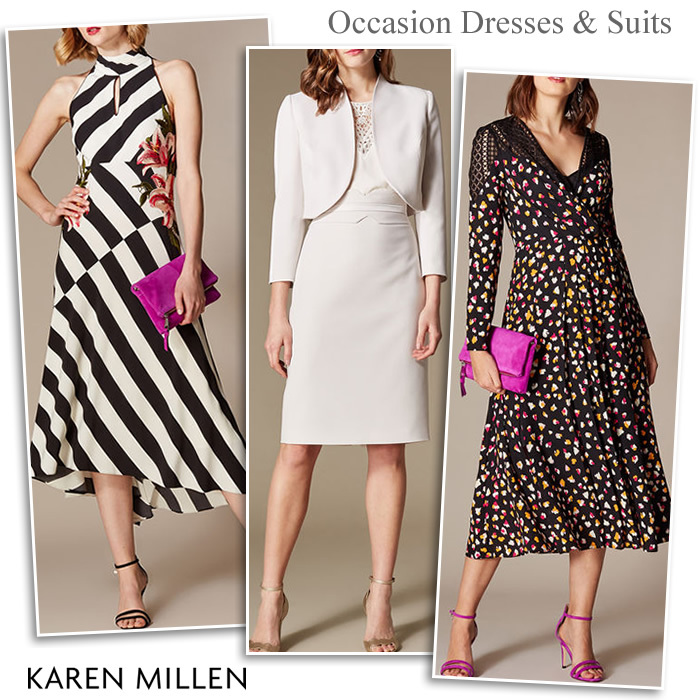 Karen Millen modern Mother of the Bride occasion dresses and skirt suits in champagne. 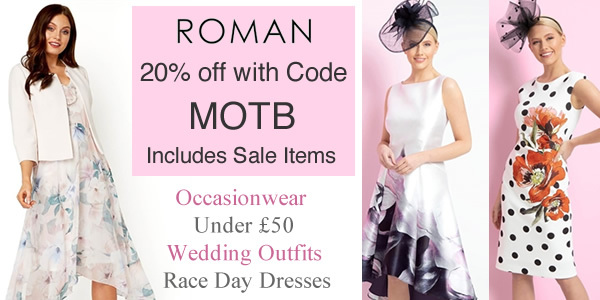 New 2019 occasionwear for weddings and race day events. Midi dress halter neck styles, animal print, black white stripes and long sleeve dresses. 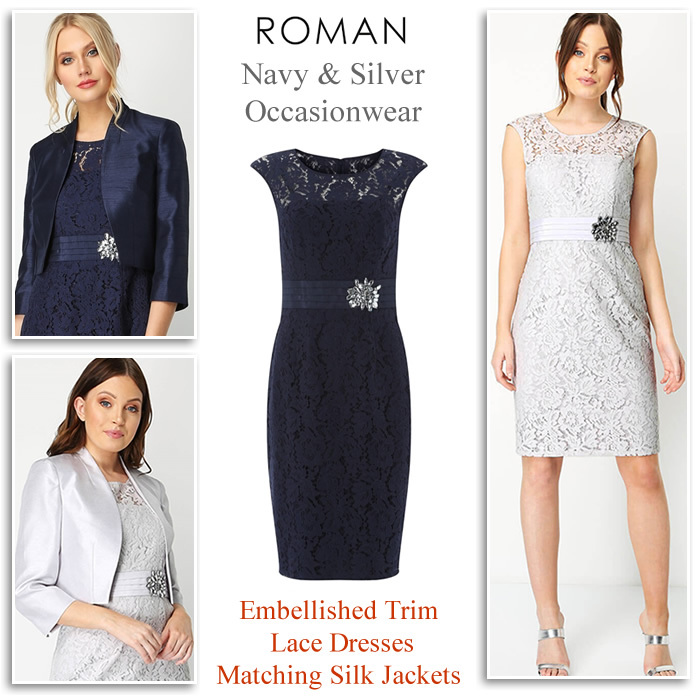 Roman Originals occasionwear includes navy and silver dresses with lace overlay and embellished waist detail. For a complete wedding outfit wear with matching silk cropped jacket for modern Mother of the Bride, Groom and guests. 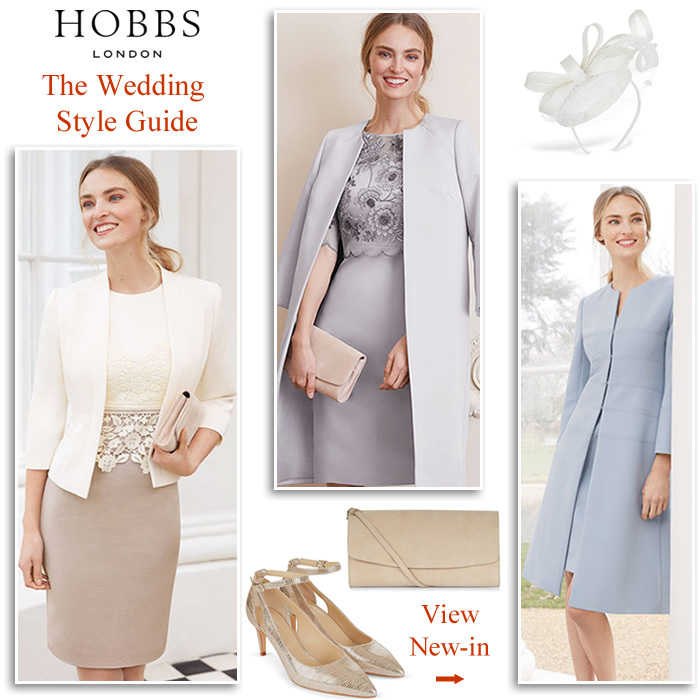 John Lewis & Partners fashionable wedding outfits for modern Mother of the Bride and wedding guests. 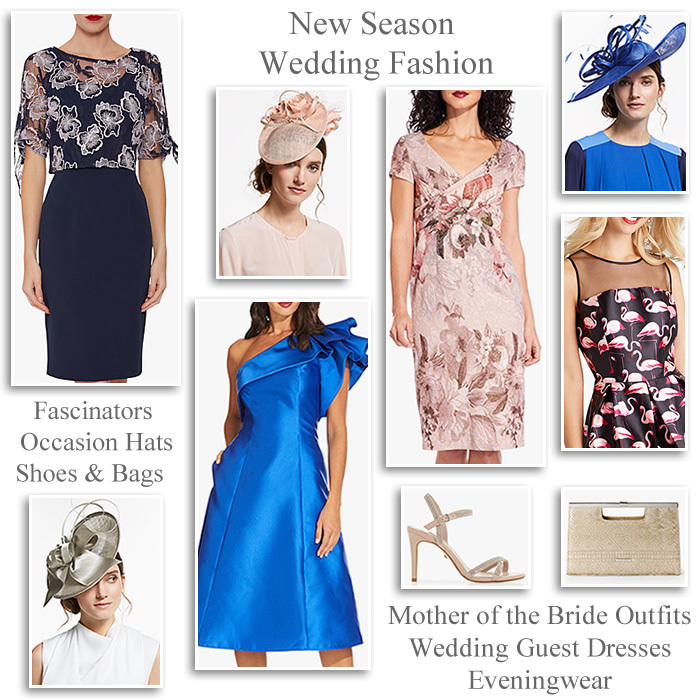 New season occasionwear include Adrianna papell, Yumi, Gina Bacconi embroidered lace dresses, race day hats and fascinators, occasion shoes and evening bags. Visit the Wedding Boutique. 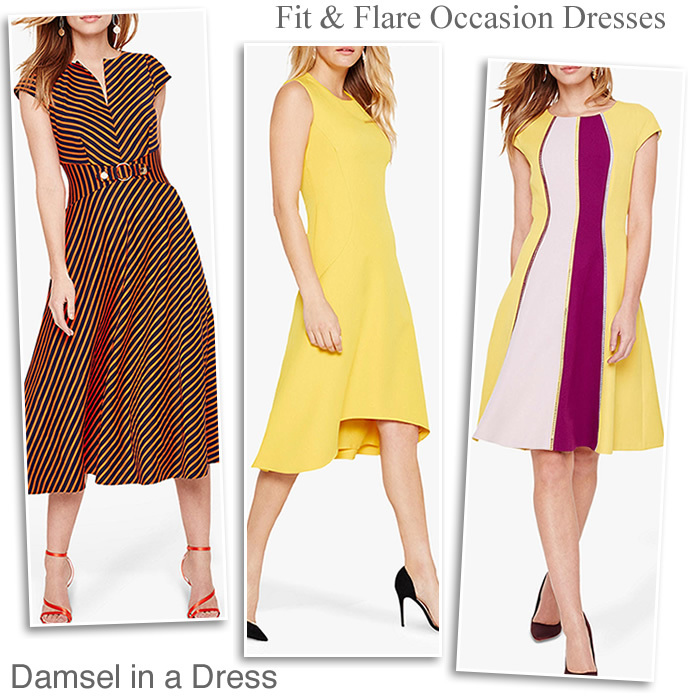 Damsel in a Dress fit and flare dresses, modern wedding and race day outfits. Midi dress in navy orange stripes and contrast belt. Colour block dress features detail panels and cap sleeves. Bright yellow sleeveless A-line dress has a high low curved hem. 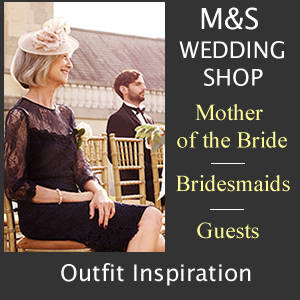 Hobbs modern Mother of the Bride, Mother of the Groom wedding outfits in black and ivory. Flattering shift style dress with trendy confetti print matching occasion coat and jacket. Coordinate with black courts and wristlet clutch bag. 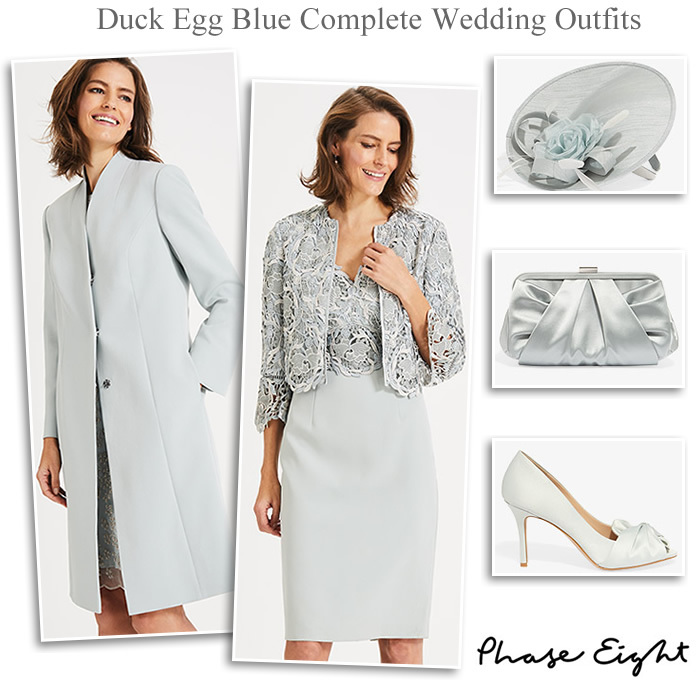 Phase Eight spring summer wedding collection in duck egg blue. 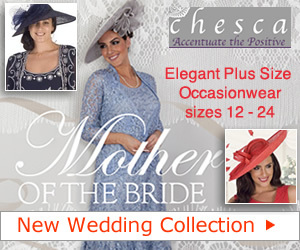 Complete occasionwear outfits for modern Mother of the Bride Groom and wedding guest. New lace dresses matching coats, cropped lace jackets, shoes, fascinator and bags. 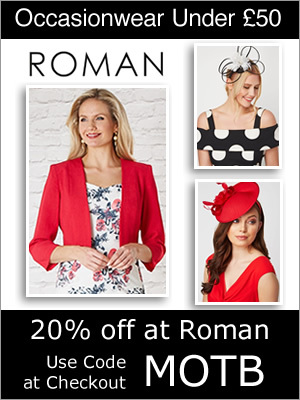 Roman Originals new season occasion dresses for young Mother of the Bride and wedding guest. 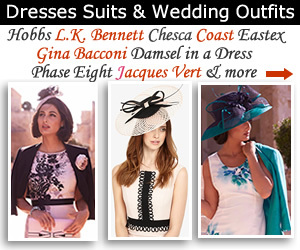 Layered, bell shape sleeves, sleeveless and dresses with sleeves, jacquard dress and jacket outfits, fascinators and bags. 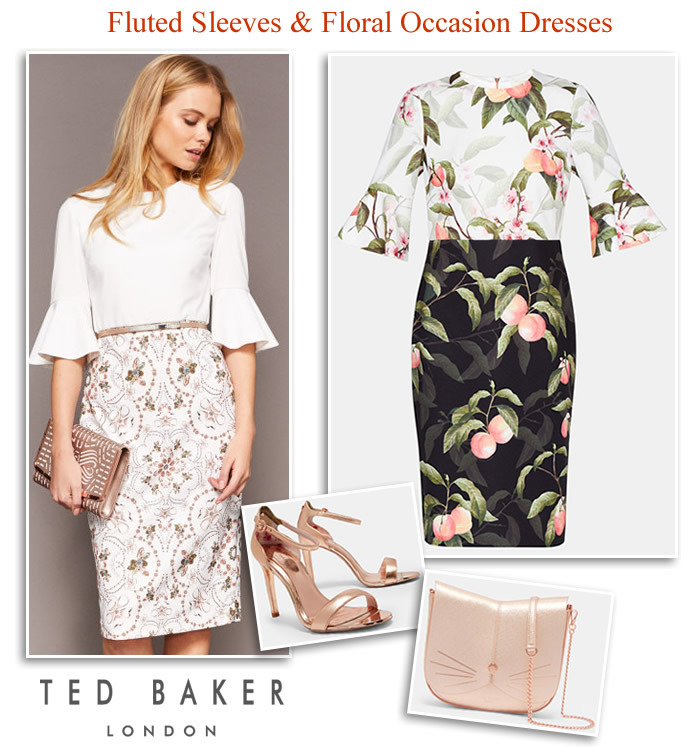 Ted Baker fashionable outfits for the modern Mother of the Bride, Groom and wedding guest. New season floral shift dresses with fluted sleeves, jewelled shoes and beaded clutch bags. 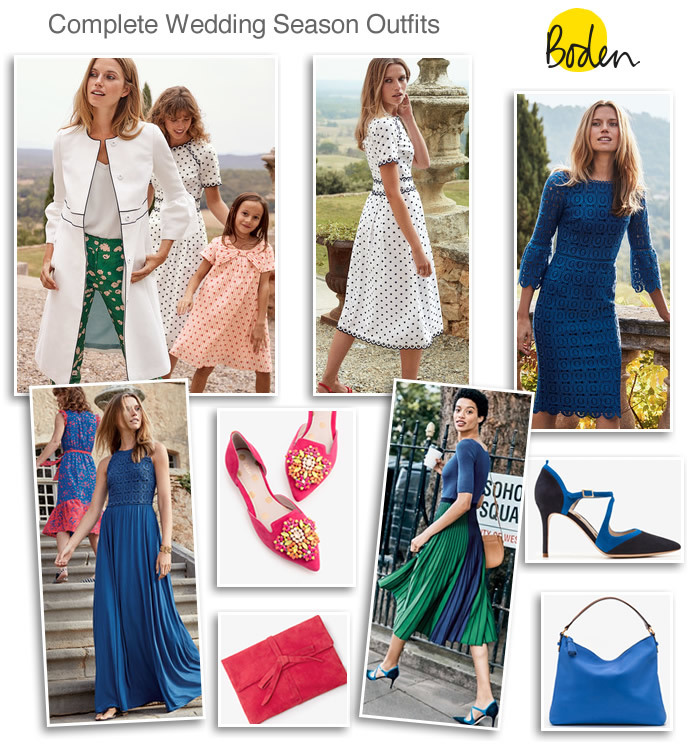 Boden occasionwear and wedding fashion for young trendy modern Mother of the Bride, Groom and guest. Occasion coats, knee length, midi and maxi dresses. 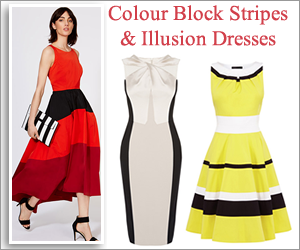 Colour block, lace and polka dot dress styles, jewelled flats, court shoes and matching bags. Look effortlessly on-trend with the best looks from your favourite fashion brands. 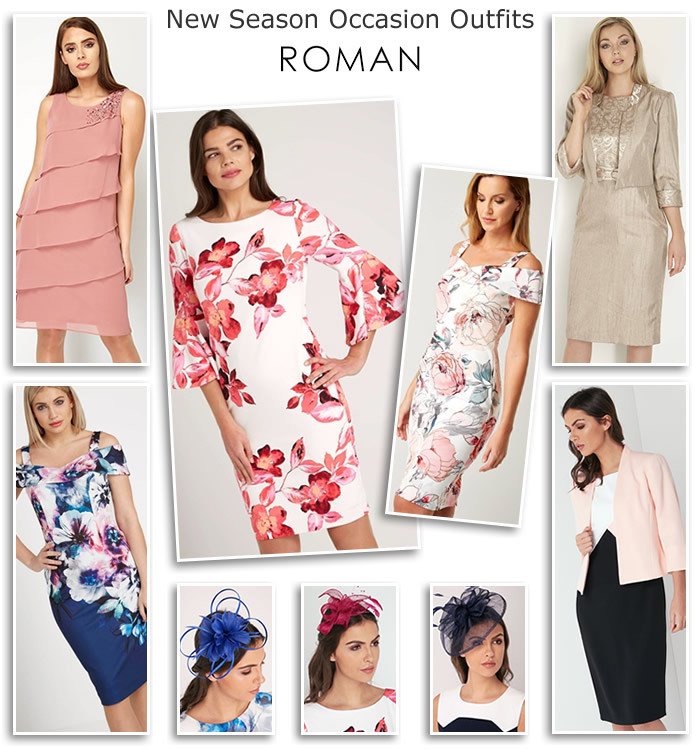 Modern Mother of the Bride, Mother of the Groom and wedding guest outfits can be found at Coast, Karen Millen, Phase Eight, Ted Baker, Reiss, L. K. Bennett and Gina Bacconi. Formal dressing needn’t be boring with smart wearable pieces and soft tailored suits that are versatile enough to mix and match for an extendable going out wardrobe. 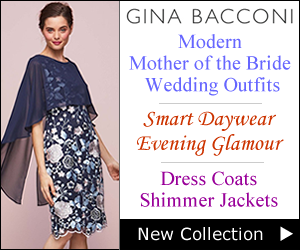 Gina Bacconi, Shubette, Adrianna Papell, Ariella, Eliza J, Ted Baker and Vera Mont are just some of the much loved brands perfect for a modern Mother of the Bride or Groom outfit. Fashion brands are realising the importance for women shopping for a young Mother of the Bride outfit. Most now have dedicated wedding sections on their online websites. Here you can find tips and ideas on how to put together a unique look that suits your style. Discover a wonderful range of luxury evening wear, occasionwear and evening gowns plus accessories to match at Coast. Since 1996 they have been dedicated to creating elegant beautiful garments for that special event and occasion. There are 52 stand-alone stores and 184 concessions in the UK and Ireland plus 46 international stores. Their collections have won several prestigious awards from the UK fashion industry and they have become one of the UK’s most successful occasionwear brands for women. You can browse and enjoy their exciting range of ladies clothing and see the latest trends for the season. Under the section occasions you’ll soon fall in love with the elegant and feminine outfits for Bridesmaids, Black Tie Event, Out with Friends, Partywear, Smart Day and Prom dresses. You can narrow your selection by sizes from 6 to 18 and choose by category, colour and price for quickly finding what you are looking for. If your style is classic, chic or modern you’ll easily find the perfect creation to make a stunning outfit. Glamorous events require the full package of sequins, silk and satin and gowns bursting with style which are in abundance online at Coast. Your up to the minute style is what sets you apart and finding the right outfit that suits your personality is the key to success. You want fashionable yet wearable choices that may be toned down to wear again at other special occasions. Phase Eight is a leading retailer in womenswear with more than 100 stores and concessions and now a fab new online boutique. Women in their thirties and above will particularly like the exciting new shopping experience, with unique designs and outfits for all occasions. You’ll soon discover a wonderful world of fashionable Phase Eight dresses, summer and winter collections, shoes, accessories and bridal wear. Phase Eight has its own individual range of clothes and are proud to offer quality and exclusive designs combined with beautiful fabrics and colours of the season. Online shopping is a breeze and easy to navigate with filters to help you find what you are looking for quickly. As you enter the site there are multiple mannequins displaying outfits which you can select. This new Get the Look feature enables you to view an entire outfit or the individual items. 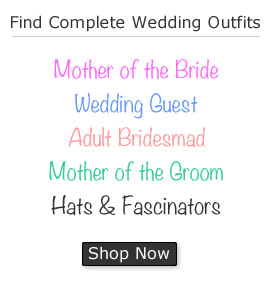 There is also a dedicated Bridal section where you will find outfits for the Bride, Bridesmaids, family and guests to a wedding plus accessories. For the perfect outfit take at a look Damsel in a Dress and discover unique styles in beautiful fabrics and finishes. Here you can saviour the delightful collections of high quality designs, dresses and smart suits that will add timeless elegance to your wardrobe. You can choose from beautifully printed silk dresses, fashionable frock coats, wool jackets and matching skirts for formal dressing and workwear. Sophisticated styles for the wedding party including elegant two piece suits for the Mother of the Bride or Groom, wedding guest and evening reception outfits. The versatility of the styles mean you will always find an outfit for any day or evening occasion. Kaliko women’s clothing offers a diverse fashion collection full of classicl sophisticated outfits and modernist styling. Here you will discover a beautiful mix of special occasion and smart everyday wear to give you a real confidence boost. Tailored made skirts and jackets plus figure flattering shift and prom style dresses ensure there’s a look to suit everyone.Exquisitely feminine and unique designs make the outfits at Kaliko perfect for special event dressing. Unique two piece outfits in shimmer fabrics will take you out in style while adaptable separates smoothly translate from day to evening.Fashionable looks and feel good fabrics define the Kaliko label and offer smart wearable pieces for work, weekend and day to night glamour. You can look lovely for less with Kaliko’s seasonal offers and their new arrivals give you the best styles to wear though out the year. When you want to make a special effort you’ll find occasionwear in the finest fabrics to make you feel beautiful. Elegant and sophisticated outfits include smartly tailored separates, pretty embellished finishes and timeless pieces. Find all your everyday favourite styles from the modern ladies clothing collection at www.dashfashion.co.uk. Sit back and browse through casual chic tops, jackets, trousers, dresses and skirts. Find smart head to toe outfits in sizes 10 – 22 that are made to flatter the figure in quality comfortable fabric. Classic designs combined with modern looks bring together a range of versatile pieces to extend your wardrobe for all your needs. Smart workwear, relaxing weekend casuals and everyday essentials are taken care of. Clothing from Dash offers a unique collection of fabrics and colours that are easy to match to suit your style.Soft and stylish knitwear has the latest looks with waterfall cardigans, batwing jumpers and shawl collar knits. Casual jackets and outerwear include gilets, jersey tie front cradigans, belted rain macs and quilted jackets. This is the place to go shopping if you love the idea of French fashion designer clothes for you and your family. The style is very much suited to women who like to express there individuality through their choice of clothes. Knowing what’s in vogue is important to you so what better way than trying out the latest trends from exclusive designs from France’s favourite style home. If you are looking for an occasion outfit with la difference, trendy daywear or simply want to up date your wardrobe, you won’t be disappointed. Online shopping at La Redoute is easy and after a couple of clicks you will enter the chic fashion world full of unique styles and adorable collections taken straight from the catwalk. You’ll find French fashion for women, lingerie, plus size, children and menswear plus style news and homeware. In addition there is smart and casual wear for everyday comfort. You can also gather information on how to make the most of this season’s colours and trends with advice on how to dress for your shape. Breezy eye-catching colours of the season can be found at Boden’s online store. It’s the perfect place for finding individual clothing to suit your style. Founded in 1991 when they initially launched their menswear products Boden went on to launch womenswear three years later. Women can have a look at ready made outfits for ideas and inspiration and try the clever feature “The outfit Maker”. This allows you to try their entire women’s range on a ‘virtual model’ so you can see how different items look together. You can also shop by style under sections such as Sporty Chic, Ditsy Florals and Downtown. Their shop by story section takes you on a journey of different styles for different occasions which make shopping fun and exciting. Fresh new looks for spring, summer favourites and chic tailoring can be found to liven up your wardrobe and bring a touch of glamour too. John Lewis is another good choice for younger modern mums with leading designers such as Damsel in a Dress, Jaeger, Kookai, L.K. Bennett, Hobbs, FWM and Ted Baker. Choosing a traditional style can be given your own personal touch by complimenting it with a flamboyant hat or fascinator. If the bride is happy with it then black and white outfits for a wedding can real give a modern twist to the special event. Brides will enjoy shopping with mum or mum in law to be and help them find what best suits their skin tone and figure. Many women are born shoppers and younger mothers will be quite happy to try high street stores for ideas. It doesn’t matter if you are a trend follower or trend setter what does matter is dressing true to your style personality. If you are a wacky dresser normally you may find traditional wedding outfits unoriginal. Online shopping has got to be the least stressful especially on the outset. Getting tips and other people’s opinions on finding something that is different and unique to you is what you will want. After all you this is your chance to shine and show you’re just as fashionable as your daughter.